When I first arrived at Harvard University in August, I was introduced to the person with whom I would be sharing an office. An assistant professor at Wayne State University, Tracy Neumann has served as the other William Lyon Mackenzie King Postdoctoral Fellow in the Canada Program at the Weatherhead Center for International Affairs at Harvard University for the 2015-2016 academic year. 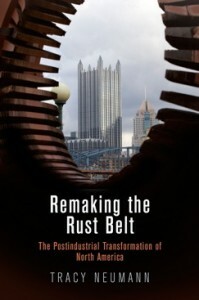 An urban historian, Tracy’s new book Remaking the Rust Belt: The Postindustrial Transformation of North America, which just came out, explores urban development (or redevelopment) in the steel towns of Pittsburgh and Hamilton. Through a transnational examination, she is able to explore how concepts and strategies of urban renewal varied between these cities and how, in both cases, these processes operated within a transatlantic framework. In this episode of the History Slam I talk with friend-of-the-show-Tracy-Neumann. We talk about the Canada Program at Harvard, industrial redevelopment in Pittsburgh and Hamilton, and some of the major differences between Canada and the United States.